What is the difference between Deluxe, Folded, Economy, and PDF Printouts? What are the differences between the questionnaires? 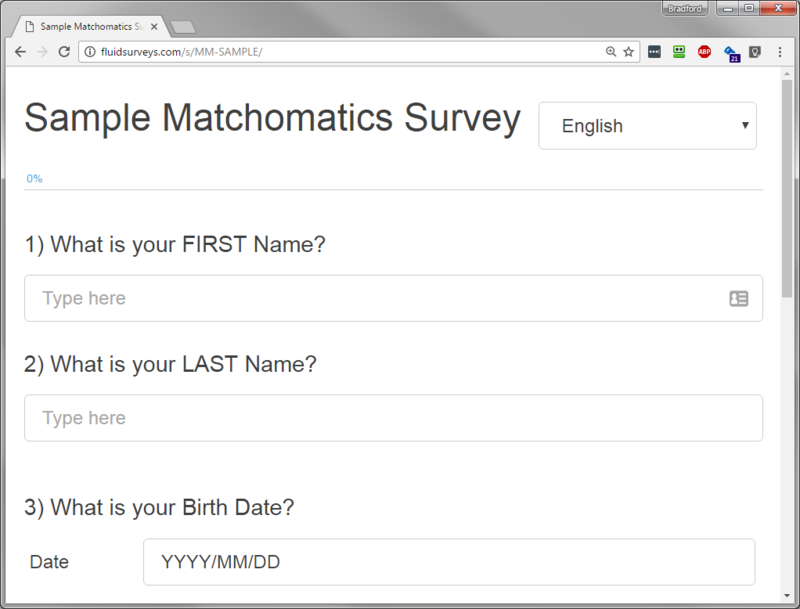 Matchomatics has 11 different questionnaires to choose from (or you can make up your own custom questionnaire). There is also a questionnaire available for Universities and Colleges. The first 9 (or 10) questions are the same on each. After that, each questionnaire has its own style. What is the Optional Gender Preference question? Why are the first 9 (or 10) questions the same on each questionnaire? The first 9 (or 10 if using a gender preference questionnaire) questions cross match each person's characteristics with each person's preferences. For example: we give a higher percentage rating for tall people for people that prefer someone tall. This makes your matches much more accurate! Can we make up our own custom questionnaire? Decide whether or not you want the optional gender preference question and then download our custom questionnaire template. If you are using paper questionnaires, use our template to print out your own custom questionnaires, or we can print them on the back of our answer forms for $0.03 each. Either way, you still need to place an order for scannable answer forms (bubble sheets) for your students to answer their questions on. If you are using an online survey, use our template to make up your own custom questionnaire, email your questionnaire to us, and we will put it online for you - for free! Can our students fill out the questionnaires online? If your school has enough tablets, computers, or smart phones we can email you a link to an online survey dedicated just for your school. You then distribute this short link to your students for them to complete their survey online. Simply email (or call) us when your students are done filling out their surveys. We will then close your survey, grab your data, and print out your printouts. We can even let you know how many students have completed your survey as it progresses. Just like paper questionnaires, it works best to have everyone fill out the survey at the same time. This guarantees the maximum participation rate, but it is not required. Can we match together only certain grades? If you wish a custom matching procedure (example: grades 9 and lower matched together and grades 10 and higher matched together) simply tell us when ordering. Matchomatics has every matching procedure you can think of! Why do Matchomatics printouts have 2 ratings for each match? 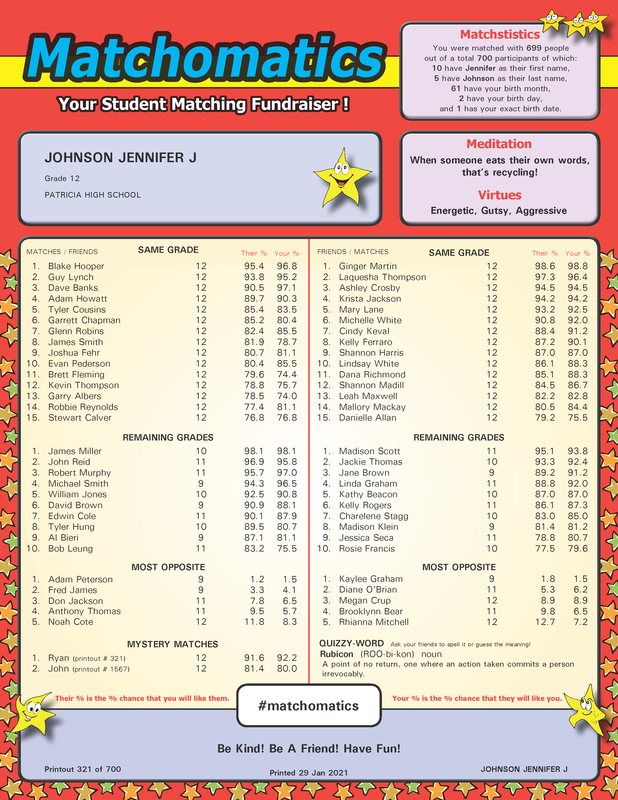 Our CROSS MATCH questions and the ability for students to mark certain questions as more important enables Matchomatics to determine 2 different ratings for each match. 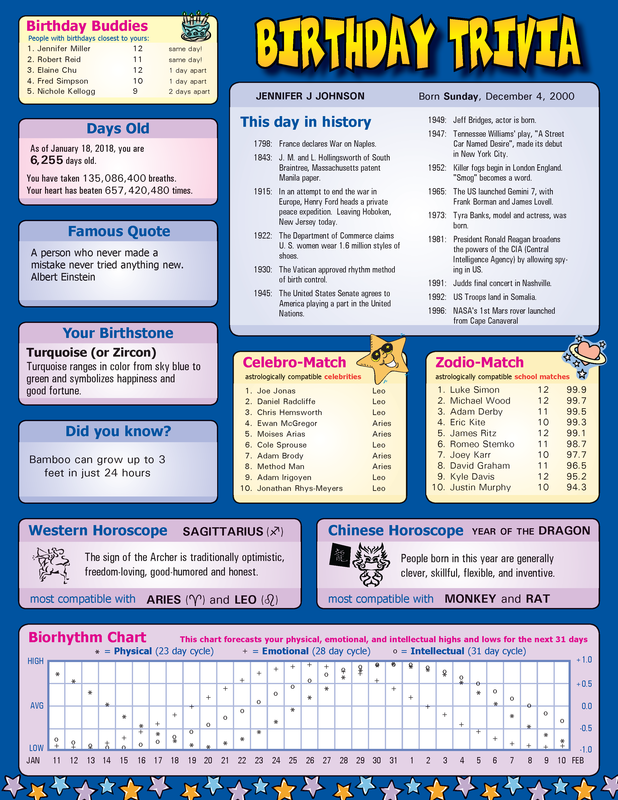 This makes your matches much more accurate! Their % is the % chance that you will like them. Your % is the % chance that they will like you. When should we order (and send) the questionnaires to have our printouts back by Valentine's Day? to give yourself lots of time to organize - especially if you have exams in January! Your goal should be to get your printouts by February 8th so that you have a week to sell them before Valentine's Day. If these dates don't work - don't freak out! Give us a call at 1-800-665-0396 and we will try and accommodate you. We often work miracles! How much does it cost to ship the paper questionnaires? Tip: Have your students fill out their questionnaires online and pay nothing for questionnaire shipping! How many questionnaires are we shipping you? How much does it cost to ship the printouts? Tip: Get your printouts emailed as a PDF File and pay nothing for printout shipping! How much should we charge our students for their printouts? Most schools charge $2 or $3 per printout because it is the easiest to handle (no quarters!) and sells the best. 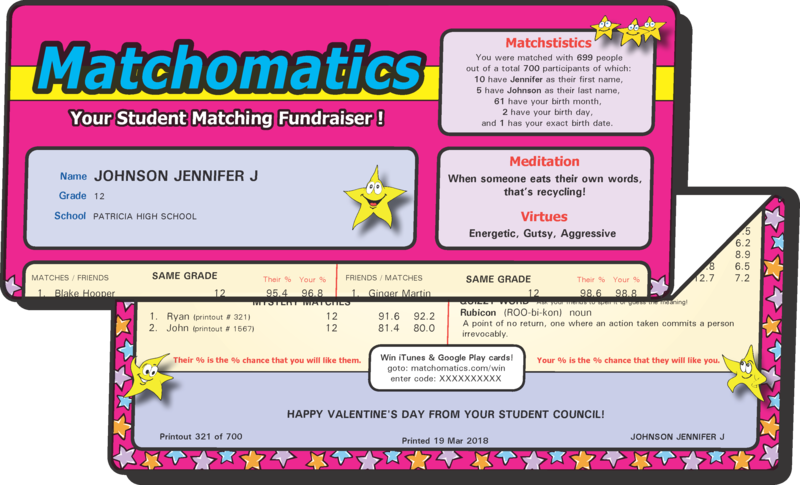 Some schools run Matchomatics as a fun non-profit activity and only charge $1 (just to cover costs) and some just give them away for free as part of their student fees! If you are ordering additional separate Remaining Grade printouts most schools charge $3 for the Same Grade printout and $2 for Remaining Grade printout. You may charge your students whatever you feel is best for your school. You can use the profit chart on our Cost & Profit page to help you figure out how much money you can potentially make with the different pricing options. How long does it take to run Matchomatics from start to finish? With Slow shipping it takes approximately 3-4 weeks from the day you order your questionnaires to the day you receive your printouts. With Medium shipping you can run the entire fundraiser in 2-3 weeks. 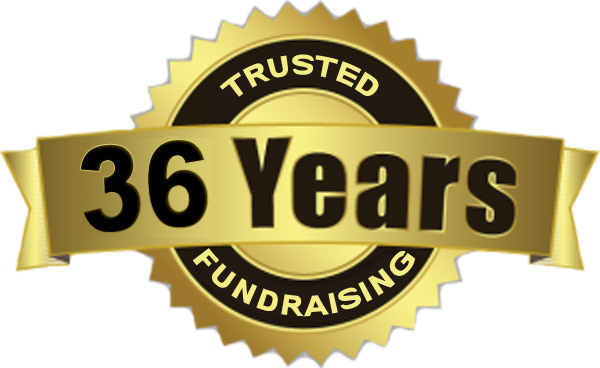 With Fast shipping you can run the entire fundraiser in as little as 1-2 weeks. 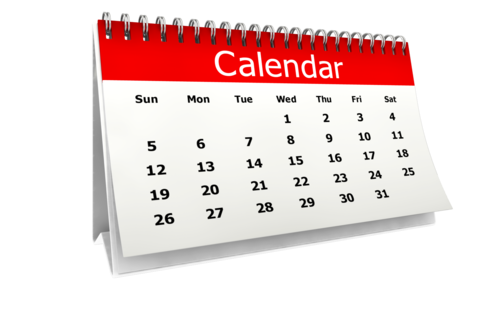 When using an online questionnaire or getting your results as a PDF file you can subtract 1-2 weeks from the above estimates! 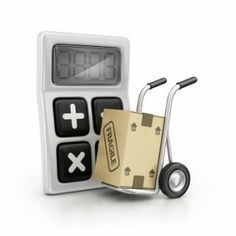 Call or Chat with us for more specific shipping estimates. Can universities, colleges, and companies use Matchomatics? We do many universities, colleges, and companies every year. Most use a custom online questionnaire which we can help you design. We also have a custom ready made university style questionnaire ready to go if that works for you. Instead of grades, universities and colleges usually use year levels to separate and group their matches. Companies (and universities) can also use departments, floors, or any other type of grouping, to separate their matches, or we can just ignore the grade question entirely. Please note: All universities, colleges, and companies are required to pay a $75 deposit before we ship or put your questionnaire online. This deposit will be applied to your final invoice but it is not refundable if your final invoice is less than $75. Basically this means you have to commit to spending at least $75 with us. Call , Chat , or for details.